The eleven traditional ingredients of the Hendrick's gin in this package are juniper, elderflower, angelica root, orris root, caraway, coriander, orange peel, lemon, cubeb pepper, yarrow and chamomile. The manufacturer has deliberately chosen an odd number of botanical ingredients. Why that is, that is the secret of the distillery. The cucumber and the Bulgarian rose really add something to the taste sensation. Hendrick's gin is a typical gin. The tonic in this package is Fever Tree Indian tonic. This fresh tonic is made of 100% natural mineral water and the purest quinine from Congo. Together with a cucumber, this tonic will enrich and complement the gin. Who dares, accepts the challenge for this delicious gin tonic cocktail. 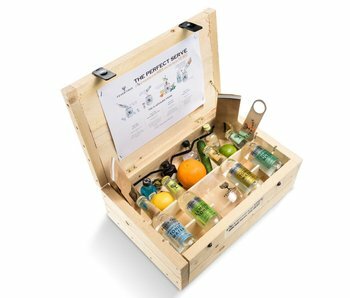 If you are looking for a luxury gift for the Hendrick's gin lover, take a look at the Hendrick's Gin Giftbox. A nice big bottle of gin and eight bottles of Fever Tree Indian tonic make this package a Hendrick's gin tonic experience. 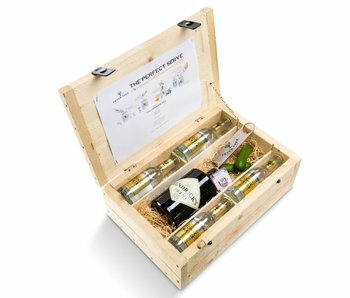 Our luxury wooden gift packaging lends itself perfectly to original business gifts, whether you give a large or a small package. The Hendrick's and Bombay Sapphire gift pack contains: - 1x bottle of Hendricks gin - 1x bottle of Bombay Sapphire gin - 1x bottle of Fever-Tree Lemon - 1x Fever-Tree Indian tonic - 1x an opener and garnish.